According to ABC reports, Obama White House Chief of Staff Rahm Emanuel is likely to leave this week to run for the Mayor of Chicago. It is no guarantee that Emanuel will win the election to be the next Mayor of Chicago, then again, it is Chicago. Although it is not surprising that Rahm Emanuel is pursuing the position, what is surprising is that he is doing so prior to the November 2010 midterm elections. 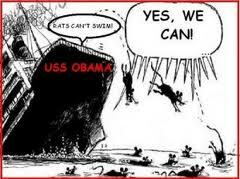 Then again, Emanuel’s leaving coupled with much of Obama’s economic team … what else do certain rodents do with a sinking ship? Although no final decision has been made because of family considerations, ABC News has learned that White House officials are preparing for Chief of Staff Rahm Emanuel to announce on Friday — as Congress adjourns for recess — that he is leaving his post to explore a run for mayor of Chicago. Rahm Emanuel’s time in as White House Chief of Staff is much like that of his boss, uninspiring, lackluster and downright terrible. Emanuel’s legacy as White House Chief of Staff will be forever his comment that, ”You never want a serious crisis to go to waste”. Welcome to the exploitative nature of the Obama way via Chicago. I guess America can now understand why other liberal. socialist agenda items were deemed more important that the economy and jobs, hmm? Hmm, Obama Chief of Staff Rahm Emanuel Leaving the White House? Again, SM was on to this months and months ago and we had some discussion of it way back when. We saw this one coming down the pike, too—not that Emanuel’s departure was very hard for anyone to predict. It was only a matter of time. Remember—-he was the “Golden Boy” —the “Brains behind everything monumental” The ” economic genius” running the show? The guy making all the tough financial decisions for our Nation that Obama was forced to support in the very beginning when the MSM questioned the risky moves he was making. They asked Obama, ” Will you ask for Rahm E.’s resignation, Mr. President?”….anyone remember what Obama said? If I cared enough I would google it and find it—-funny how all the comments Obama made may come back to haunt him present day- once Emanual jumps ship. Hope the MSM remembers what Obama was continually quoted as saying then, too. Watch Obama do a complete 360 and deny it all, attempting to put a new spin out there and attempting to blame Mr. Emanuel for many of the costly MISTAKES OBAMA MADE AND APPROVED OF HIMSELF! Rahm the newest and most official “fall guy” in terms of the US’s current lousy economy? Aw, Gee Guys—-say it isn’t so? not let let a serious crisis go to waste? Please leave the COS office ASAP. Another rat like you joining the ranks in Chicago wont hurt as it would be like putting another prisoner in jail. Just go as far away from the white house as possible and don’t forget to take your cheeze with you Mickey! Rats are the first off the ship. Looks like Obama’s old senate seat will goto Republican Mark Kirkon November 2. Good ridden….hope the door doesn’t hit em in the arse on his way out….Horses arse…. chicago could use another thug, he is already trained. Whether or not rats can swim, appears these find it better to drown…. don’t be fooled, the white house is up to something. either they are running away from something that is brewing bad for them or this is just part of the plan to bring in team b to inflict more harm on the USA. i don’t trust them. Is there really going to be an election or is all he got to do is show up for the job? Today-all over the MSM that Rahm will resign this week so that he can start campaigning for his latest political quest= MAYORAL CANDIDATE OF CHICAGO! What a trip! Actually, also fairly predictable. Mr. Emmanuel is the dirty rat who has jumped from one sinking ship…straight over to one of the most corrupt political locations in all of American History & Geography….Good ‘Ol Chi-Town.